What kind of sorcery illusion lets these two blocks be the same color? One is dark, one is light. One is gray, one is white. These are obviously two different blocks with two different colors right? Wrong. 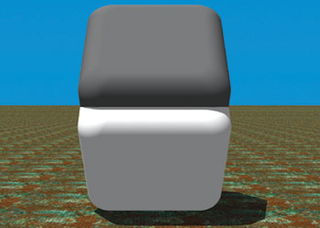 The two blocks are the same color. Seriously, they're the same shade of gray. Just place your finger across the seam (where the blocks meet in the middle) to reveal the illusion. Just crazy. This illusion, pointed out by David Smith and Kottke, makes me never want to trust my eyes again.